Three HAZARD publications see the light of day just prior to the final conference. Publications are numbered 27, 28 and 29. HAZARD publication 29 comes from Sweden and discusses transport damage analysis of dangerous goods. Håkan Torstensson and Daniel Ekwall from University of Borås have written a state-of-the-art report mapping the situation of cargo damage occurence emphasising dangerous goods in Baltic Sea Region seaports. This report can be used as a guidance for designing and testing packagings and packages for transport especially in cases, where higher than normal rates of damages have been observed. For future research, authors suggest a simple risk assessment for traditionally most common causes of cargo damage, but also in relation with lost goods reasons. Expert team from Hamburg University of Technology, Germany, authored publication 28. 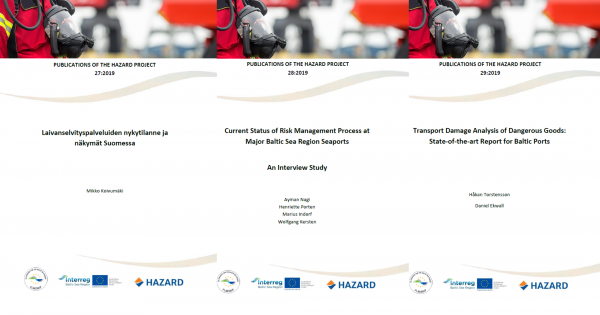 Ayman Nagi, Henriette Porten, Marius Indorf and Wolfgang Kersten conducted an interview study on the current status of risk management process at major Baltic Sea Region seaports. Through 38 interviews it became apparent that no standard or one universally defined process exists for risk management. Authors call for a development of a clear framework, process and guidelines for risk management. Additionally, co-operation among stakeholders should be utilised to a greater extent to facilitate an efficient knowledge transfer process. Publication 27 authored by Mikko Koivumäki as his Master’s thesis for Turku School of Economics at University of Turku, Finland, reviews the current status of ship clearance services in Finland and provides future scenarios on how the situation most likely will change. Key observations by the author were the strong position of shipping companies in the industry, the growing importance of technological innovations in the near future and the central role of shipping agents in shipping processes especially from the flow of information aspect. Alongside with technological advances, environmental questions are constantly becoming more important, creating simultaneously positive development opportunities and pressure to innovate the service product both for shipping and ship clearance industries. This publication is available in Finnish only. All HAZARD publications can be found under Publications on the site.